Opinion Outpost Review. Honest Way To Make Money Online Or Scam? Please note, although I have an account with Opinion Outpost, I am NOT an affiliate. This review is from my own experience, as well research from information and testimonials that are available online in the public domain. Any conclusions drawn by myself are opinions. Opinion Outpost (Survey Sampling International, LLC) is an online survey company that acts as a go-between, connecting you (your opinions) with organizations such as corporations. They gather information from you, and share it with market researchers looking to better understand the people they are marketing too. Online surveys are one of the easiest ways to make money online, but they don't provide job replacing income. Opinion Outpost offers cash and rewards, as well as points you can redeem for gift vouchers from companies like Alawar (video games), Amazon, and Paypal (for cash). You can also use your points on iTunes. Not a bad deal for simply sharing your opinion. You can even use your points to make a donation to the Red Cross. In addition, Opinion Outpost has a quarterly prize draw of $10,000 if you live in the US ($1250 if you live in Canada, and £5000 for those in the UK). Incorporated in January 2009, they have been around now for several years. Their parent company, Survey Sampling International was started in September of 1977. Although they are not accredited by the Better Business Bureau, Opinion Outpost is not a scam. They are a legitimate company that you can earn money from. However, they suffer the same challenges as other online survey companies do. Issues of privacy, as well as complaints of not getting paid for completing surveys for unexplained reasons. I’ll get more into those in a moment. Once you sign up for a free account, you will be sent a confirmation email and asked to complete your profile. This process, in my opinion, is an invasive screening process which is the first issue with online survey companies. If you’re comfortable with sharing your personal information, as well as employment and income details then this will be non-issue. Unfortunately, this step is necessary so Opinion Outpost can accurately match you to relevant surveys. Incorrect information leads to the other troubling issue with doing online surveys; spending hours online answering questions, but not getting paid. How Invasive Is The Screening Process? It could be argued that just being online today is invasive, and that there's no such thing as privacy. But, there is something about these questions that give you a stripped down feeling, as if you're being sized up for something. I've included the list of questions you will be asked if you decide to sign up and complete your user profile. And remember, you are providing this information for market research (which is not private). The screening (setting up your profile) process takes about 30 minutes. If you just click on answers without reading or considering whether you want to share specific information you could get through it in half that time). Current employment status (eg. Full-time, part-time etc.)? Describe the department you work in. Describe your job roles and responsibilities. Are you involved in making company purchasing decisions, and in what areas? Estimate how many computers your company has. Specifics regarding your industry, and more about your specific job role. Then they ask for you company/employer name as well as your job title. Next you will be asked some household questions. How many children you have, as well as their age and gender? Describe your ideal vacation. Where would it be, what would you like about it? Make, model and year of your primary vehicle. Do you own it or lease it? List of other products you own, and the brands you use? Your current cellular mobile provider? List the types of insurance you own. Do you invest and where? Household assets such as cash, liquid assets and investments? Questions about your web browsing activities. Your opinions on the trustworthiness of authority figures such as police, political leaders and firefighters. Do you enjoy listening to music and how much? Whew! Including the sign-up, that’s 30 to 45 minutes and if you’re like me, you won’t be comfortable answering most of those questions. After that you can choose to take a survey from your members dashboard, and surveys will also be emailed to you. Is Opinion Outpost A Scam? ​Just in case you were skimming the headlines (I do it too 😀 ) and missed it earlier, I wanted to revisit this question once more. What I like about online surveys is that they don’t promise you luxury lifestyles, exotic cars, and complete financial independence. There are many legitimate methods of making money online, but some push the boundaries and are borderline scams simply because of the crazy promises or claims they make. Opinion Outpost makes no such promises or claims. It’s not a scam. It’s a legitmate way to make a little extra spending money. However, one of the complaints you will often read (from people calling it a scam), is that they put significant time into doing surveys, but in the end are told they did not qualifying and won’t be getting paid. Unfortunately, this is the nature of market research. 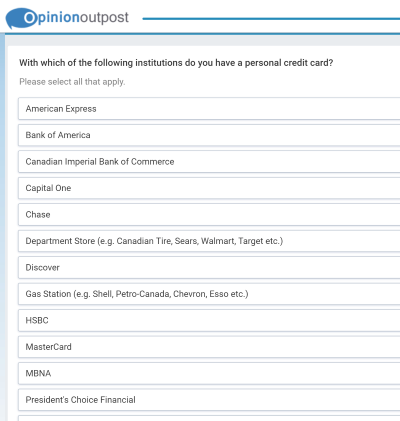 Opinion Outpost is selling your information to its clients, but if it’s not relevant or does not satisfy the survey's goal… they won’t be paid for it either. The problem is that sometimes your eligibility for the survey (or lack of eligibility) is only revealed during the actual survey. The reasons for not qualifying are not always clear though, and it’s easy to get curious and wonder if Opinion Outpost is still getting paid by their client, and making a larger profit by not paying you. There is no proof of this but as I stated before, this is a common challenge with all (or at least the ones I know of) online survey companies. Please don’t shoot the messenger, but if you were thinking of turning this online survey thing into a full or part-time job, it’s not going to work. 100 points is equal to $10.00. The length of time it takes to earn points varies, but here are couple examples. As you can see, you don’t earn many points for the time involved. Although it varies, if we use an average of 10 points for a 15 minute survey, you will earn 40 points in an hour. At that rate, even if they supplied you with a steady stream of surveys (and their estimated times are accurate) it would take 2 ½ hours to earn $10.00 which works out to $4/hr. It's something, and if your're sitting around doing nothing anyway it might be worth it, but there are better ways to earn money online. And then, when you consider you may not qualify for every survey, it’s easy to see why some members get frustrated and call it a scam. There is also a minimum payout, which means you will need to complete a minimum number of surveys before getting paid. Some companies like Vindale Research for example have a $50 payout which means you can spend weeks and even months doing surveys before you actually get paid. In fact, many people give up long before they accumulate the minimum points required and therefore never see a dime for their efforts. Opinion Outpost however, only has a $10 minimum which is far more reasonable than some of it’s competitors. They also have a refer-a-friend program so you can earn a little extra money that way... although, unlike some similar programs, they are a little vague on the details. Is Opinion Outpost For You? It’s legit, you can earn money with it, but the big question is whether or not Opinion Outpost is for you? What are you goals, and what are you willing to give up for them? In my opinion, online surveys don’t pay enough to justify the time required to do them, and personally, I’m not comfortable providing the private information they require. However, online surveys are great if you actually enjoy doing surveys. They’re good for people who are not looking for a big payday (just a little extra money), and who are not interested in other ways of making money online. Despite the personal questions, they do make a decent effort to try and match you with relevant surveys. The $10,000 quarterly prize draw (although only $1250 for Canadians). I wouldn’t give it more thought than a lottery ticket, but it’s definitely a bonus if you decide to sign up. As a Canadian, I like that it’s available in Canada… as well as other countries. It should go without saying, but since the web is overflowing with scams, I like that Opinion Outpost is legit. Like all paid online surveys, it’s not a significant source of income. Especially for the amount of time you will invest. Having to share personal and private information. The minimum payout is relatively low at $10 (or 100 points) but that means you’ll still spend significant time before seeing any money. 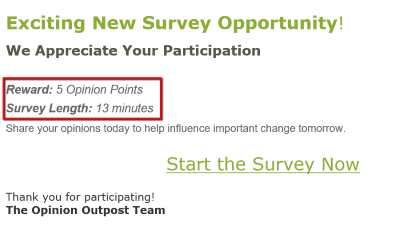 For example, an email I received today was to complete a 15-point survey with an estimated length of 28 minutes. For the right person, Opinion Outpost can be a great way to pass the time. If you’re the type of person who scrolls through Facebook, or plays games while watching TV… then doing an online survey instead is a great way to earn a little extra money. It could be a good way to pay your monthly cell phone bill for example. However, if you’re more serious about investing your spare time into making money online, and you have an entrepreneurial streak, starting an online business is my recommendation. It will require a more focused effort, but the financial and educational benefits can be life changing. Thanks for stopping by and I hope this Opinion Outpost Review was helpful. Also, please leave a comment, I’d love to hear your thoughts. 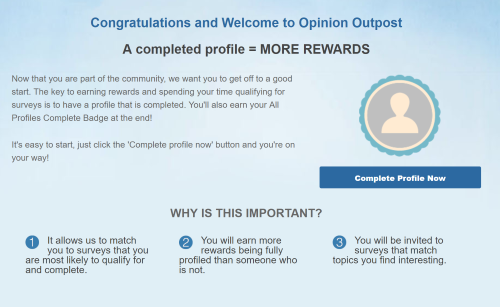 Have you used Opinion Outpost before? Thanks for your detailed review and behind the scenes info. I have often considered taking surveys, but I agree the depth of information they need from you seems a little excessive. I also appreciate knowing that it’s not worth the time if you are looking for a significant income boost! This is really cool. It has always been a dream of mine to quit regular 9-5 job and become an full time internet marketer. But like most things worth having, that is easier said than done lol. It just that there are so many scams online, it just takes it hard for a beginner like me to tell which one to trusts. I am glad your writing reviews on these products, makes it so much easier to choose one. Opinion outpost definitely looks interesting, I am going to check it out.